Fingernails should be in a little better shape around Albion and Petersburg this week. 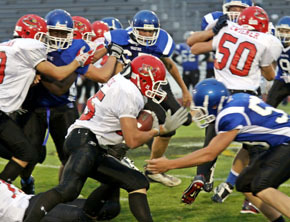 For the first time in 2011, the Boone Central football team was not engaged in a frantic finish Friday, as the Cardinals dominated host Wayne and pulled away for a comfortable 35-0 win at Wayne State College’s Memorial Stadium. Boone Central was obviously the more physical team in this contest, sacking Wayne QB Gage Rethwisch five times while holding the Blue Devils to 69 total yards (including -8 yards rushing). The Cardinals used a punishing ground attack of their own (287 yards), building a 22-0 halftime lead and never really being threatened by the hosts. “As a team, we were pleased with the improvements we made from the week before,” said Card Coach Arnie Johnson. “We were able to sustain our blocks and protect the ball much better than our first two games. We feel we’re heading in the right direction. Boone Central finished with 287 yards rushing and 107 passing for 394 total – a whopping 325-yard advantage over the hosts. The Cards gained 25 first downs and were 6-of-11 on third down conversions. The game was a bit sloppy, with Wayne penalized 12 times for 71 yards and BC drawing eight flags (85 yards).